BEIJING — Normally tight-lipped Chinese officials are opening up about their disappointment in President Trump's withdrawal from the global climate pact signed in Paris. California Gov. 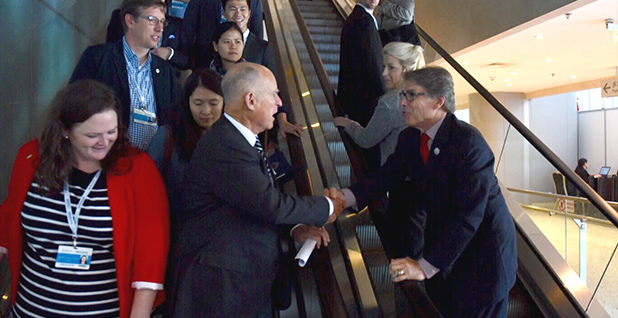 Jerry Brown (D) has been in China this week to promote action on climate change, hopscotching from one event to another and signing nonbinding agreements to work on climate and clean energy policies with government officials, industry groups and academics. His last public meeting served as a therapy session of sorts for Chinese and U.S. climate officials who had worked on the Paris Agreement. In an ornate, red-roofed building on Tsinghua University's leafy campus, Brown announced one last agreement yesterday — to form a U.S.-China Climate Change Institute. He also gave voice to the swirling frustrations of experts. "When we have a world where the president of the most powerful country says climate change is not only a hoax but a Chinese hoax, you know we're in big trouble," Brown said to applause. Chinese officials, who are typically reserved and rote in their public appearances, were candid in their assessments of Trump's announcement concerning the Paris Agreement. "I have long been involved in the negotiations on the Paris accord, and I have personally experienced the excitement of reaching the Paris accord," China's lead climate envoy, Xie Zhenhua, said through a translator. "At that time, many negotiators were so excited, they even shed tears. I still have a vivid memory of those exciting moments. That is why I am so deeply disappointed at the announcement of President Trump." "Mr. Trump has made a wrong decision," said Shi Dinghuan, former secretary-general of China's Ministry of Science and Technology, who was also at the Paris talks. "I don't think that will stand in the way of our commitment to contributing to the global process against climate change." Chinese officials also contrasted their stances on climate with Trump's reversal, a connection that Chinese President Xi Jinping did not draw in his meeting with Brown earlier in the week. "The Chinese leaders have sent the signal to the international community that China will continue to honor its international commitments, and we will do it fully no matter how much change will take place in other countries," said Xie, the lead envoy. "China's commitment will never change, and our actions will never change." The head of California's air pollution and climate agency took note of Xie's fervency. "I believe he has become much more open and much more willing to articulate his position, and that may just reflect his now years of experience, including the high point of having succeeded in Paris," said Mary Nichols, chairwoman of the California Air Resources Board. "On a human level, I can certainly empathize with his feeling about seeing this all undercut, undermined by this new administration in Washington." "I think Gov. Brown's visit at this time is very important," said Zhou Dadi, a lead author on the Intergovernmental Panel on Climate Change's 2014 report and a former official in China's National Development and Reform Commission. "China is the largest economy in the world, and California is the largest economy in the United States," he added. "California represents the most advanced state in the United States in terms of fighting climate change and achieving low-carbon development, so I think you are really sending the most positive signal to us."